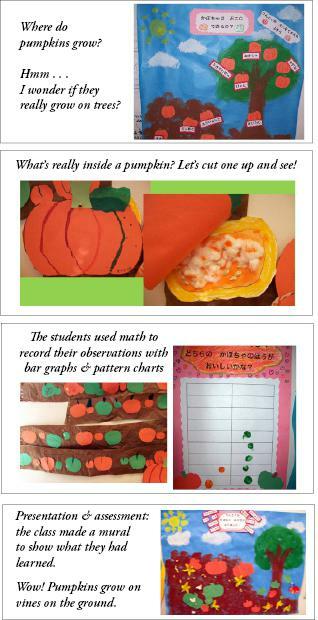 When the Japanese 3-year-olds class explored the central idea that “Plants and animals change throughout their lives,” the students traveled to a pumpkin patch to study the life cycle of a pumpkin. Upon returning, they took on the role of scientists by dissecting a real pumpkin and then discussing the function of seeds. As the unit continued, teacher Chisa Chilgren noticed how the children incorporated concepts from the unit into their free play. They also showed better understanding of a Japanese song about pumpkins (that they had been singing since the beginning of the unit). One parent recounted her surprise when her child came home and explained how baby pumpkins grow from the bottom of a yellow flower.